As one of the world's most popular Hedging Palms, the Golden Cane or Areca Palm hardly needs an introduction. Outdoors, it quickly develops into an elegant, mid-sized palm with densely clustering, slender, green trunks; yellow crown shafts and leafstalks; and recurving, V-shaped leaves. Dypsis lutescens originally comes from Madagascar, the home of so many exciting palms, where it grows in coastal forest on sandy soils. It will tolerate cool conditions to some extent, as well as light frosts, and is best suited to climates ranging from sub-tropical to tropical. Landscape professionals throughout the State of Florida depend on A Quality Plant to provide them with Areca Palms in a wide variety of sizes. We grow both Field Grown Areca Palms and Container Areca Palms in quantity to meet our customers Palm needs. 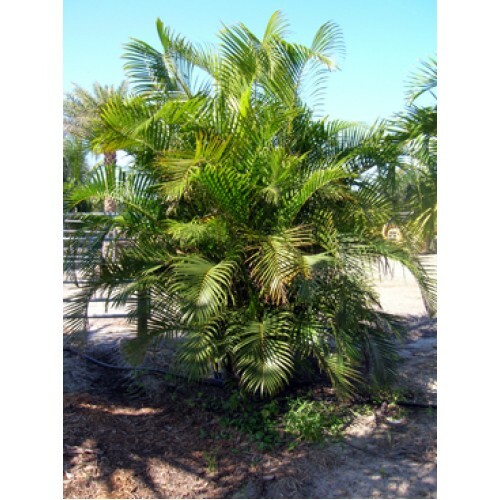 The Areca palm hedge or screen is widely used in central and south Florida. The Areca Palm forms a full and bushy hedge that can be a solid screen when planted closely together. Planting distance can be 4 to 6 feet on center depending on the size of the Areca Palm when planted and depending on how much of a hurry the customer is in. The Areca Palm likes full sun and will tend to look more golden in full sun. The Areca Palm in partial or full shade will look a darker green color. The Areca Palm can take some cold and even freezing temperatures for short duration. Frost will certainly damage the foliage at any temperature. Zone 10 is fine and zone 9b in a microclimate or with protection. The landscape criteria may inspire a look that requires the exposure of the canes. They are a smooth beautiful silver/green color. Our customer service professionals are ready to speak with you today regarding your next palm purchase!